Siri Dharma has been teaching kundalini yoga since 1996 and was one of the first trainers of Kundalini Yoga teachers in South Africa. She taught yoga and meditation to addicts in drug rehab facilities for 18 years. 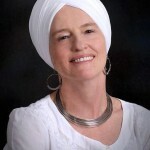 She has headed the Beyond Addiction program in South since 2016.Siri Dharma is a musician and plays kirtan in a band called the Dharma Sisters. She has recorded three CDs of spiritual music and mantra, two CDs with African choirs. When she is not teaching yoga, Siri Dharma is a qualified lawyer with law degrees from both Wits University, Johannesburg and Stanford University, USA. She has practiced as both a human rights lawyer and a corporate lawyer and now trains and mentors young lawyers in one of Johannesburg’s biggest law firms. She is also an accredited mediator.